If you run a color-coded office, we offer folder dividers in colors like red, blue, gray, and yellow to keep important files organized. 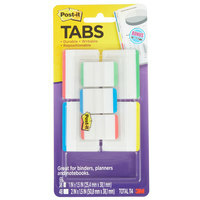 Some of these tabs also have multiple pockets, which allow you to create more detailed labels. If you need items that have tabs in particular locations, we offer bottom, side, and top tab products to work with any kind of filing system. Also make sure to check out other great items from 3M, Avery, Oxford, Redi-Tag, Smead, Swingline and Tabbies. If you run a doctor’s office or hospital, alphabetical dividers allow you to keep patient files separated and in order. You can also purchase folder tabs to fill your dividers in a variety of shades, which is helpful for color-coding. Whether you run a corporate office, university registrar’s office, or hospital nurses’ station, folder dividers and tabs are sure to come in handy on a daily basis. For related products, check out our office tables, office desks, carts, and stands, and lobby, reception, and lounge seating. If you're wondering where to buy 3m folder dividers and folder tabs, we have a large selection of 3m folder dividers and folder tabs for sale at the lowest prices.